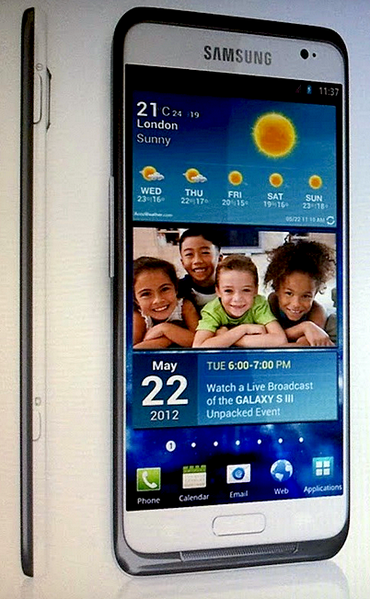 Samsung Galaxy S3 Release Date and Photo Unveiled?! Could This Be Samsung's 2012 Flagship Phone? Thanks to everyone who sent this in! I appreciate it. But looking back at that recent 'iPad HD' name fiasco, I hope you understand if I take this with a grain of salt. So what does this shot tell us about the 'device'? 2. It has an almost edge-to-edge display. 3. Unlike previous Samsung flagship Android releases, it has a dedicated camera button. 4. 'May 22, 2012, 6:00-7:00 PM, London': Will this be S3's official announcement and release date? 5. It flaunts a speaker grill below the home button. 6. It has what looks like metal or ceramic edging. 7. Just like Samsung Galaxy S2, it has this odd 'camera bump' at the rear. But what are the rumors? 1. Samsung Galaxy S3 will only be 7 millimeters thick. 2. It will come with a ceramic case. 3. It will feature an 8 MegaPixel camera at the back and 2 MegaPixel shooter in front. 4. It will run Android 4.0 Ice Cream Sandwich with a Quad Core 1.5 GHz ARM Cortex A9 Exynos 4412 chipset CPU. 5. It will support 4G LTE mobile connectivity. 6. It will flaunt a 4.8-inch Super AMOLED HD display. 7. It will handle multitasking with 2 GB of RAM. 1. I think most of the rumored specifications will turn out accurate. Heck, I hope the 2 GB of RAM is for real; One can never have enough RAM! 2. 7 millimeters of thickness would be amazing. But only if battery size won't be compromised. 3. Not so sure about the design. I don't think it's handsome enough for a flagship release. But maybe it's just the quality of the photo. Will wait for more 'press shots'. So what do you think, TP Friends? Could this be Samsung Galaxy S3?